It is now a real tradition for watchmakers to observe Chinese New Year by creating beautiful, decorative timepieces adorned with some symbolic depiction of the appropriate sign of the Chinese zodiac, often using rare, artistic techniques to pay tribute to the eastern calendar. The rooster is the eleventh sign of the 12-year zodiac cycle. According to Chinese astrology, the rooster is loyal and punctual – a great fit for a timepiece! The Year of the Rooster begins on January 28, 2017. Jaquet Droz has authentic historic ties to China, making this type of limited edition a natural fit as well as a real feast for the eyes. 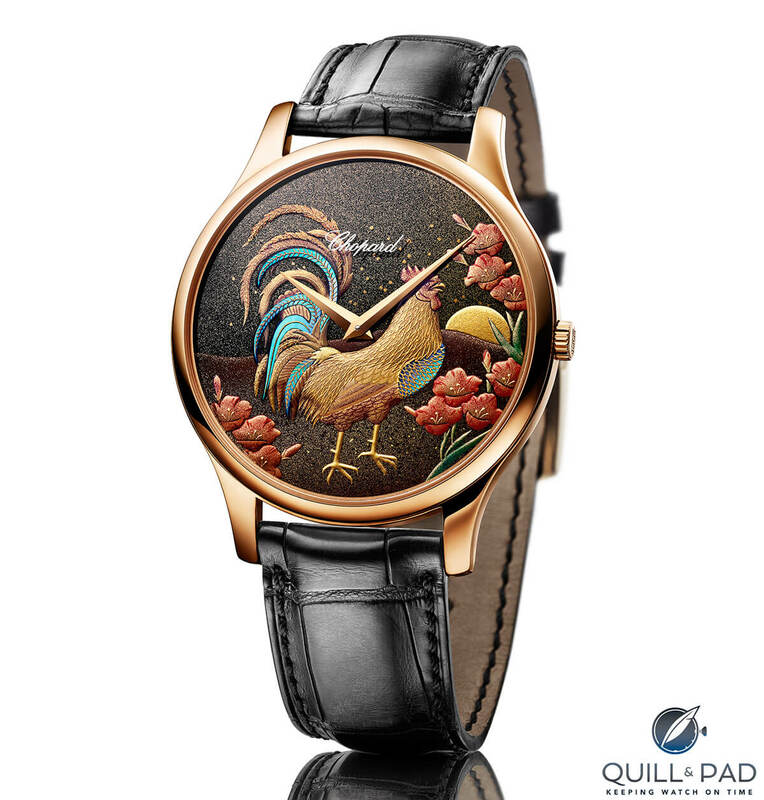 The Jaquet Droz Tribute to the Fire Rooster edition comprises four variations of the Petite Heure Minute, two with gorgeous miniature painting and two with colorful miniature rooster sculptures and jadeite. 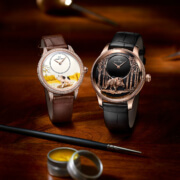 For more information, please visit www.jaquet-droz.com/en/news/jaquet-droz-celebrates-the-chinese-new-year-tribute-the-fire-rooster. View through the display back of the Jaquet Droz Petite Heure Minute Relief Rooster: that rotor is a feast for the eyes! Donzé Cadrans has created another beautiful tribute to the Chinese New Year with this gorgeous animal in enamel. Using the champlevé technique combined with a delicate chiseling of the metal parts as a risky final step, this dial is a colorful, masterful work of art. For more on how Donzé Cadrans, a Ulysse Nardin-owned company, creates such masterpieces see Why Do Ulysse Nardin’s Dials Look So Good? Because Donzé Cadrans Authentically Fires Enamel. For more information, please visit https://www.ulysse-nardin.com/news/classico-rooster. Anita Porchet, a master of the enamel art form (and Gaïa Award winner), once again created the dial for 2017’s Chinese zodiac-themed timepiece by Piaget. Here she used the cloisonné enamel technique to stage the glorious, strutting animal. Marking the tenth anniversary of the exquisite Tourbillon Relatif, Piaget offers a unique piece to a fortunate collector, who can have his or her example’s dial, case engravings, and enamel markings entirely personalized. This unique edition includes the 12 Chinese characters associated with each of the 12 signs of the Chinese zodiac. In an annual limited edition called Legend of the Chinese Zodiac, Vacheron Constantin’s artistic tribute to the Chinese New Year is based on the idea of a Chinese paper cutting art form called jianzhi. A motif representing foliage stemming from Chinese iconography makes for a lovely background. It is engraved into the gold dial using a bas relief technique. After engraving, grand feu enamel is added in layers that are successively fired in a kiln. The dial provides a calendar in the truest sense of the word: its four windows respectively show the current hours, minutes, day, and date. These watches are powered by automatic Caliber 2460 G4. 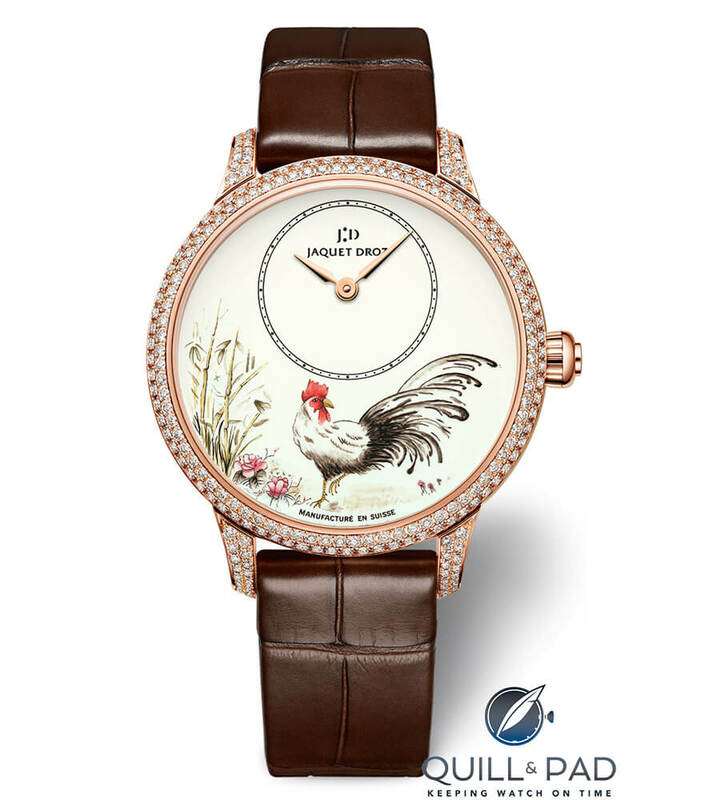 For more information, please visit www.vacheron-constantin.com/en2/watches/metiers-d-art/metiersdart-metiers-d-art-the-legend-of-the-chinese-zodiac-year-of-the-rooster. The annual Chopard L.U.C. XP horological tribute to the Chinese New Year combines arts, crafts, and technology originating in Switzerland, China, and Japan: Chopard Manufacture’s L.U.C XP model with its ultra-thin movement; Japanese expertise in lacquer and mother-of-pearl marquetry; and China’s zodiacal symbolism. The type of urushi lacquer utilized here is called maki-e, which sees the lacquered coating sprinkled with a metal powder – in this case gold – to accentuate the outlines of the depicted figures. As Panerai’s ninth creation in its series of annual Chinese zodiac-themed wristwatches, the Luminor 1950 Sealand 3 Days Automatic Acciaio follows tributes to the ox, tiger, rabbit, dragon, snake, horse, goat, and monkey zodiac signs. This year’s rooster resides on the special steel cover of the watch, which has been decorated with an Italian engraving technique known as sparsello, whose name reflects the tool used to achieve the art. After polishing, the grooves are inlaid with layers of gold threads, which are beaten until they fill them out. This provides the decorative yellow color. 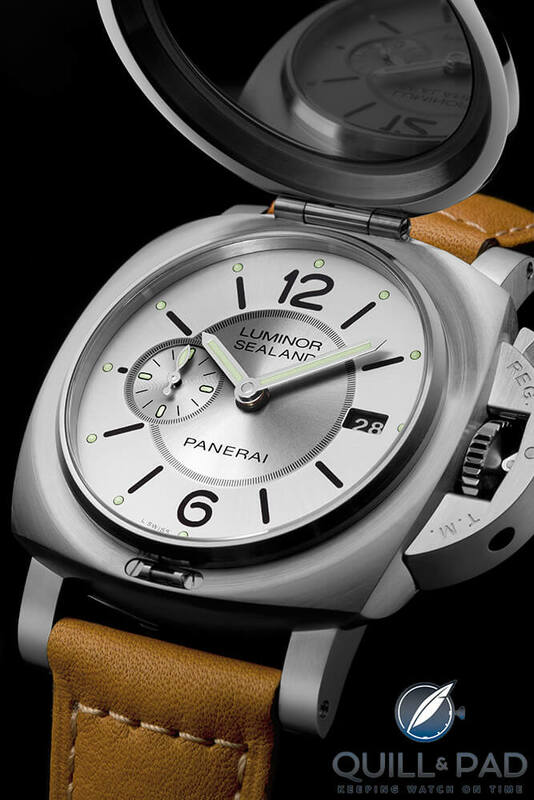 For more information, please visit www.panerai.com/en/collections/special-editions/2016/luminor-1950-sealand-3-days-automatic-acciaio-44mm_pam00850. It’s hard to believe they (some Swiss watch Houses, Mansions, Manufacturers….lol ) are still looking to the China Market? Was the Blancpain Chinese Calendar a success? I really don’t know, but I did read articles about the market having a lot of product that had to be redistributed. Maybe it’s just emotional sales which my work..